Long couple of days but they are behind us now and we are heading to spend some time with Doug's family for a little bit and then head home. Emily was only accessed once yesterday but we made sure that didn't happen again. Emily did awesome on her scan sitting very still and not moving but she always does. Today was the first day that she wore the video goggles the whole time watching the movie Frozen. And she only asked one time during the scan how much longer! We are not biased or anything because she is out kid, but she really is an amazing. People meet her and they fall in love with her because she is just one loveable kid. After scans we had lunch with my dad and then went up to clinic and waited. We waited what seemed like forever in the waiting room since they were waiting for the scans to be read. We were both pretty nervous with getting results bc of the wait time and worried after seeing the scans come across the screen from the MIBG. 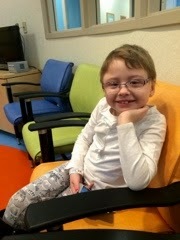 In April it will mark one year that Emily has been on the DFMO trial with such a great quality of life!! We want this to continue. She continues to go to school, enjoy her friends and in April she wants to join cheerleading through her school. We want her to be able to do all these things and in May Emily turns 8! Through the last 4 years of treatments, it's these little things seem so big!! She deserves it!!! Overall scans are stable with some of her spots having a mild uptake and some of her other spots having a mild decrease in uptake. There is one spot on her back between T5-T7 that Dr Sholler has some concern about that seems to have a bit more uptake than many of her previous scans. 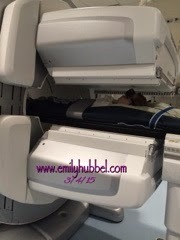 Emily does not have any new disease which is definitely a good thing, but Dr Sholler would like Emily to have a PET scan done at home and have the scans sent to Dr Sholler to review. We will see about getting these done next week, because we would really like to know where things are. We will get with Dr Gowda tomorrow and see what he has going on with getting this scheduled. If they are negative, we will continue on the DFMO and if they are positive we will need to get with Dr Sholler and talk about doing something else. We did talk with her about the velcade DFMO trial so we do have something in mind that we could possibly put her on, which would require us to make another trip to Michigan to start on this. Dr Sholler would like us to continue with what we have been doing but said if the PET scan came back positive we need to change some things up. We also talked about doing a bone biopsy on one of her tumors which could get more information about her tumors and see what is going on, but that would probably be something that we talk about doing for next trip. This biopsy would be like doing a bone marrow biopsy and would require sedation, but it would give us make up of her tumor, but it would not give us make up of her other tumors. Dr Sholler was very happy with how well she looked and was doing and her LDH and urine markers were all low. So we are happy with stable and we are hopeful that her PET scan remain negative. Once the PET has been set up we will update so everyone can send lots of love for Emily and thoughts!! Thank you to my dad for coming and being there with us. It really meant a lot to us and honestly took off a lot of the anxiety and stress that we normally feel when we are there for scans. The girls really enjoyed having you here to spend time with us.. Thank you! We hope you have a safe flight back to VA where they are calling for more snow and the schools are closed today. We are hopeful in many ways that school will be closed tomorrow so that the daddy/daughter dance that was cancelled last week and moved to this weekend will be cancelled and moved that the girls can go with Doug to the dance. We will continue to keep you all up to date on how things are... Thank you for continuing to follow along our journey. Remember to hug and kiss your kids and tell them how much you love them! I agree, Emily is very special and sweet. Praying and praying the PET scans will show no problems. Always praying for remission! !